Our ON HAND merchandise in ON SALE! Check it out before our stock is gone! Shirts, Hats, Tanks, Sweatshirts, and Baby Onesies are all on sale! Flat Rate of $5 for shipping or pick up available! Join us on Sunday, April 28 to get Revved up for the RIDE! We NEED you to get your butts to this PIT CREW! This is where you hear all the details about our biggest fundraiser of the year and pick up all your marketing material. Posters, fliers, yard signs and raffle tickets PLUS your opportunity for 1st pick of the best volunteer shifts at the Ride! We'll have plethora of caffeinated products available along with a delicious assortment of breakfast pastries, bagels and other yummies. It wouldn't be a proper BCBC meeting if there wasn't yummy food and drinks available! Your memorial donation will be used to Change the Minds & Save the Lives of those who come after the ones we've lost. Let the world know how your dog inspired you to be Part of the Solution. Your dog's contribution to the cause will live on and on through your generosity. 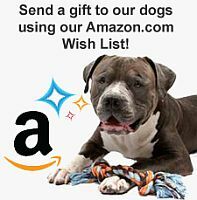 Click the link below to see the wish list for BCBC Rescues! Any of these items will help us prepare for them tremendously! 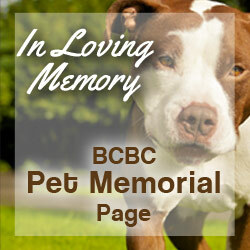 Please consider helping BCBC help others by making a donation. Because of your rave reviews, BCBC was designated a 2018 TOP-RATED nonprofit by Great Nonprofits.